Chaplain (Capt.) Merle D. Brown was the last Army Chaplain casualty of the Vietnam War. On Easter Sunday, April 11, 1971, he was killed in a helicopter crash in the Quang Ngai province. Brown is honored on Panel 4W, Row 118 of the Vietnam Veterans Memorial. 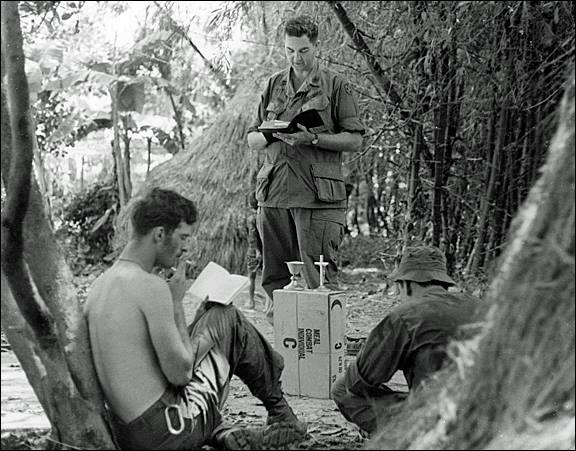 The American Lutheran chaplain is pictured in Vietnam on the National Day of Prayer on October 21, 1970. He had to use a C-ration box as an altar while he reading from the Bible with the men of the Americal Division’s 11th Infantry Brigade’s 1st Battalion, 20th Infantry. God Bless all who serve, especially Chaplains.